Some corporations and non-government organizations also assign sensitive information to multiple levels of protection, either from a desire to protect trade secrets, or because of laws and regulations governing various matters such as personal privacy, sealed legal proceedings and the timing of financial information releases. With the passage of time much classified information becomes much less sensitive, and may be declassified and made public. 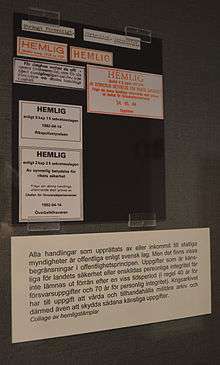 Since the late twentieth century there has been freedom of information legislation in some countries, whereby the public is deemed to have the right to all information that is not considered to be damaging if released. 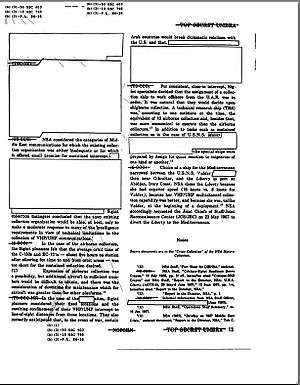 Sometimes documents are released with information still considered confidential obscured (redacted), as in the example at right. The Washington Post reports in an investigation entitled Top Secret America, that per 2010 "An estimated 854,000 people ... hold top-secret security clearances" in the United States. April 17, 1947 Atomic Energy Commission memo from Colonel O.G. Haywood, Jr. to Dr. Fidler at the Oak Ridge Laboratory in Tennessee. As of 2010, Executive Order 13526 bans classification of documents simply to "conceal violations of law, inefficiency, or administrative error" or "prevent embarrassment to a person, organization, or agency". Confidential material would cause damage or be prejudicial to national security if publicly available. Restricted material would cause "undesirable effects" if publicly available. Some countries do not have such a classification; in public sectors, such as commercial industries, such a level is also called and known as "Private Information". Official material forms the generality of government business, public service delivery and commercial activity. This includes a diverse range of information, of varying sensitivities, and with differing consequences resulting from compromise or loss. OFFICIAL information must be secured against a threat model that is broadly similar to that faced by a large private company. The OFFICIAL classification replaces the Confidential and Restricted classifications after April 2014 in the UK. Clearance is a general classification, that comprises a variety of rules controlling the level of permission required to view so classified information, and how it must be stored, transmitted, and destroyed. Additionally, access is restricted on a "need to know" basis. Simply possessing a clearance does not automatically authorize the individual to view all material classified at that level or below that level. The individual must present a legitimate "need to know" in addition to the proper level of clearance. ECIPS, the European Centre for Information Policy and Security, has 4 levels of Security Information, COSMIC (TOP SECRET), EC-SECRET, EC-CONFIDENTIAL and EC-COMMITTEE. In Brazil, a top secret (Ultra-secreto) government-issued document may be classified for a period of 25 years, which may be extended up to another 25 years. Thus, no document remains classified for more than 50 years. This is mandated by the 2011 Information Access Law (Lei de Acesso à Informação), a change from the previous rule, under which documents could have their classification time length renewed indefinitely, effectively shuttering state secrets from the public. The 2011 law applies retroactively to existing documents. There are two main type of sensitive information designation used by the Government of Canada: Classified and Protected. The access and protection of both types of information is governed by the Security of Information Act, effective December 24, 2001, replacing the Official Secrets Act 1981. To access the information, a person must have the appropriate level of clearance and a need to know. In addition, the caveat "For Canadian Eyes Only" may be used to restrict Classified or Protected information to only Canadian citizens with the appropriate level of clearance and need to know. Top Secret: This applies when compromise might reasonably cause exceptionally grave injury to the national interest. The possible impact must be great, immediate and irreparable. Secret: This applies when compromise might reasonably cause serious injury to the national interest. Confidential: When disclosure might reasonably cause injury to the national interest. Protected information is not classified. Protected information pertains to any sensitive information that does not relate to national security and cannot be disclosed under the access and privacy legislation because of the possible injury to particular public or private interests. Protected C (Extremely Sensitive protected information): is used to protect extremely sensitive information, which if compromised, could reasonably be expected to cause extremely grave injury outside the national interest. Examples could include bankruptcy, identities of informants in criminal investigations, etc. Protected B (Particularly Sensitive protected information): is used to protect information that could cause severe injury or damage to the people or group involved if it was released. Examples include medical records, annual personnel performance reviews, income tax returns, etc. Protected A (Low-Sensitive protected information): is applied to low sensitivity information that should not be disclosed to the public without authorization and could reasonably be expected to cause injury or embarrassment outside the national interest. Example of Protected A information could include employee number, pay deposit banking information, etc. Federal Cabinet (Queen's Privy Council for Canada) papers are either protected (i.e. overhead slides prepared to make presentations to Cabinet) or classified (draft legislation, certain memos). 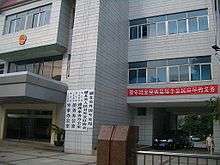 A building in Wuhan housing provincial offices for dealing with foreign countries etc. The red slogan says, "Protection of national secrets is a duty of every citizen"
The Criminal Law of the People's Republic of China (which is not operative in the Special Administrative Regions of Hong Kong and Macao) makes it a crime to release a state secret. Regulation and enforcement is carried out by the National Administration for the Protection of State Secrets. Any other matters classified as "state secrets" by the national State Secrets Bureau. Secret (秘密): Defined as "ordinary state secrets whose disclosure would cause harm to state security and national interests". Once their usage period is expired, documents are transferred to archives, where they are either destroyed (by incineration, crushing or electrical overtension), or stored. The Traffic Light Protocol was developed by the G8 countries to enable the sharing of sensitive information between government agencies and corporations. This protocol has now been accepted as a model for trusted information exchange by over 30 other countries. The protocol provides for four "information sharing levels" for the handling of sensitive information. ↑ "United States Cryptologic History: Attack on a Sigint Collector, the U.S.S. Liberty" (PDF). NSA.gov. Archived from the original (PDF) on 2012-10-30. Retrieved 2012-11-14. ↑ Turner, Stansfield (2005). Burn Before Reading: Presidents, CIA Directors and Secret Intelligence. New York: Hyperion. ISBN 9780786867820. ↑ Goldsmith, Jack (29 September 2010). "Classified Information in Woodward's 'Obama's Wars'". Lawfare. Retrieved 5 September 2015. ↑ Random House Webster's Unabridged Dictionary (2. ed., [Nachdr.] ed.). New York [u.a. ]: Random House. 2004. ISBN 0375425993. ↑ Defense Technical Information Center (April 1997). "DoD Guide to Marking Classified Documents" (PDF). dtic.mil. ↑ Federation of American Scientists (June 8, 2013). "Chapter 7. CLASSIFICATION LEVELS". fas.org. ↑ Priest, Dana; Arkin, William (19 July 2010). "A hidden world, growing beyond control". The Washington Post. Retrieved 5 September 2015. ↑ Atomic Energy Commission's Declassification Review of Reports on Human Experiments and the Public Relations and Legal Liability Consequences, presented as evidence during the 1994 ACHRE hearings. ↑ Section 1.7 (1) and (2). ↑ United States Coast Guard. "E-PME Enlisted PROFESSIONAL MILITARY EDUCATION Reporting Unsecured and Securing Classified Material 4.G.03" (PDF). uscg.mil. 1 2 George Washington University. "ATTACHMENT 2 AR 320-5, CLASSIFICATION OFC. Army Regulations (1936)". gwu.edu. 1 2 Government Security Classifications April 2014. HMG Cabinet Office. October 2013. ↑ "Decision of 23 September 2013 on the security rules for protecting EU classified information". 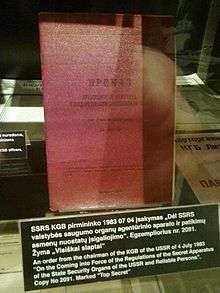 Official Journal of the European Union. 15 October 2013. Retrieved 5 September 2015. ↑ "306652_CM6554" (PDF). Archived from the original (PDF) on 2005-05-25. Retrieved 2012-11-14. ↑ Security of Information Act, Archived January 16, 2008, at the Wayback Machine. ↑ "Industrial Security Services - Frequently Asked Questions". Public Works and Government Services Canada. Government of Canada. Retrieved 8 November 2012. ↑ "ARCHIVED - Non-Insured Health Benefits Program: Privacy Code, 2005 (Appendix II)". Health Canada, First Nations and Inuit Health Branch. 2015. Retrieved 5 September 2015. ↑ Security Policy - Manager's Handbook Archived June 1, 2005, at the Wayback Machine. ↑ "Archived - Access to Information Guidelines - Confidences of the Queen's Privy Council for Canada". Treasury Board of Canada Secretariat. 2015. Archived from the original on 17 October 2015. Retrieved 5 September 2015. 1 2 Translation per Human Rights in China, State Secrets: China's Legal Labyrinth, (2007). ↑ "Code pénal - Article 413-9". Legifrance. 2009. Retrieved 5 September 2015. ↑ Archived December 1, 2006, at the Wayback Machine. ↑ LCQ3: Equal Opportunities Commission Archived December 27, 2008, at the Wayback Machine. 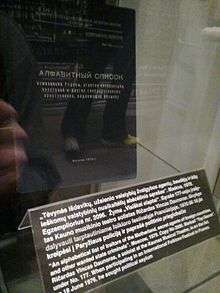 ↑ "Penal Code of Romania, art. 150". Retrieved January 28, 2013. ↑ "Law no. 182/2002 on protection of classified information". Retrieved January 28, 2013. ↑ "Penal Code of Romania, art. 157". Retrieved January 28, 2013. ↑ "Understanding the Security Policy Framework & frequently asked questions". Cabinet Office. 1 April 2013. Retrieved 5 September 2015. 1 2 Aftergood, Steven (August 27, 2014). "Gov't Resists Court Review of State Secrets". Secrecy News. Federation of American Scientists. Retrieved 2014-09-26. ↑ Ellsberg, Daniel (30 May 2014). "Daniel Ellsberg: Snowden would not get a fair trial – and Kerry is wrong". The Guardian. Retrieved 2014-09-26. ↑ "Wet- en regelgeving - Besluit voorschrift informatiebeveiliging rijksdienst – bijzondere informatie - BWBR0016435" (in Dutch). Wetten.overheid.nl. Retrieved 2013-07-04. ↑ "The Classified National Security Information Protection Act". 2003-02-06. Retrieved 2014-03-26. ↑ "Employment Background Checks: A Jobseeker's Guide | Privacy Rights Clearinghouse". Privacyrights.org. Retrieved 2011-12-12. ↑ "Development of Policies for Protection of Critical Information Infrastructures" (PDF). Cecd.ord. Retrieved 2012-11-14. ↑ "'Re: OpenSSH security advisory: cbc.adv' - MARC". Marc.info. Retrieved 2011-12-12.